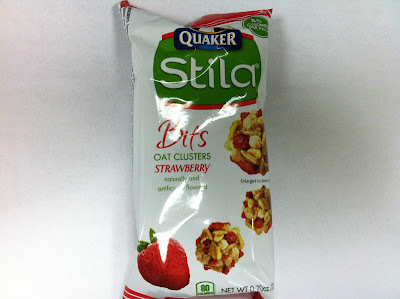 I've mentioned snack time at my office before and in a recent visit for my 3:00 p.m. snack (LOL), I walked into the break room and laid out on the table was something I've not only never seen before, but also have not heard of before in these Quaker Stila Bits Strawberry Oat Clusters. So, being the adventurous type that I am (I use that term VERY loosely), I grabbed a small packof these to try out so that I could add to my extensive volume of Quaker product reviews. 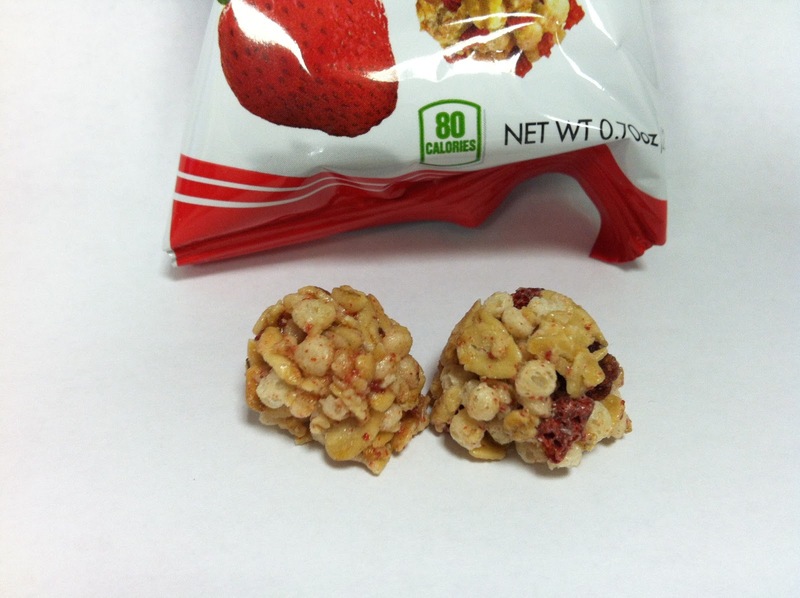 Each little 0.70 ounce pack pack is 80 calories of oat cluster goodness. As you can see, these are just little bits of granola and oat cluster goodness with bits of dried strawberries mixed throughout. The entire cluster held together by honey, molasses and various syrups and is actually topped with what is labeled in the ingredients as "Yogurt Flavored Confectionary Coating." Um, yeah. Anyway, I would say each cluster is about the circumference of a nickel coin and is about a half inch in height. And before you ask, yes, I did get out my ruler like a major science dork. They smell of strawberry, so at least Quaker has got that part right. Taking my first bite...well, my only bite since one of these was so small, I was impressed by the crunch of these, but I guess I can't be surprised since they are granola. One thing I was not impressed by was the strength of the strawberry flavor because it was not really there. Well, that's not true...there was some strawberry flavor, but it didn't hit until the very end and what flavor did hit, did not hit until the very end of each cluster. I would very loosely compare the flavor to a breakfast cereal that had a slight strawberry twinge. In those clusters that had a good amount of dried strawberries, you did get a bit stronger flavor in addition to something somewhat soft to chew on that countered the crunch of the granola. Buy It or Fly By It? Well, nothing about these was great, but they were a good, honest snack with a bit of flavor and crunch, so I give these a BUY IT rating. A pack of these are a good low calorie treat to get you through your afternoon or morning and now that I've just found out about these, I'm going to start looking for them in my local grocery store to see what else is out there.